About me: My hometown is Tempe, AZ. I completed my undergraduate education at Arizona State University with a major in Aeronautical Management Technology. I plan on pursuing an Online MBA from the W.P. Carey School of Business at my alma mater. As a Naval Flight Officer in the U.S. Navy, online learning gives me the flexibility to receive an MBA from a school of my choice while allowing me to study at my own pace from thousands of miles away. Although I’m applying for an online MBA, ASU’s online program was recently ranked #2 by U.S. News and World Report, so I wanted my application to be as competitive as possible. My military experience has given me a unique, yet extremely limited, frame of reference with respect to business operations, so I am eager to hear viewpoints from teammates who have years of experience in the civilian workforce. I will be eligible for military retirement in 2023 at only 39 years of age, leaving me plenty of time to pursue a civilian career. With my transition out of the military still several years away I do not have an exact civilian career goal in mind, but I certainly plan to continue working and providing for my family. My hope is that an MBA that will present more job opportunities, make me more competitive in a variety of fields of business, and/or carry the potential for greater compensation. I can enjoy immediate benefits from an MBA too. Recent budget constraints have brought a great deal of scrutiny to Navy spending decisions. As a future Navy Department Head, I may very well find myself in charge of command-level budget requests and allocations. The Navy will also document a “Finance” subspecialty code in my official officer record that can open doors to new sets of orders that are currently unavailable. My biggest challenge: I took my first practice test without studying and scored a respectable 580 with a 35 in the quantitative section (36th percentile), and a 35 in the verbal section (74th percentile). Since my quantitative score was in such a lower percentile than my verbal score I focused 100% of my studies on math. I completed every single math-related video lesson and flashcard on Magoosh, and I attempted a little less than half the Magoosh practice math questions (222 of 513). The video lessons made it easy to re-learn number properties, powers and roots, and algebraic equations and inequalities. The videos also provided helpful strategies for tackling word problems, which I often struggle with. Still, I think the most difficult challenge I faced was with data sufficiency questions. I found it hard to remember that if I could answer a YES/NO question with a definitive “NO,” then the statement was sufficient. For example, a question would ask, “is x > 0?” I would determine that Statement 1 proved there was no way for x to be positive, and I would routinely (and incorrectly) consider Statement 1 insufficient. If this sounds confusing, watch the Data Sufficiency lessons! Thanks to Magoosh, my quantitative score jumped from 35 to 44 (up from the 36th percentile to the 61st percentile). 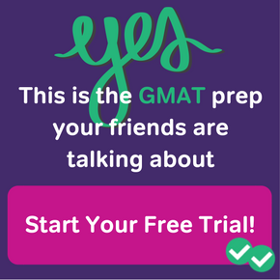 I did not complete a single verbal lesson, flashcard or practice question, yet my verbal score improved to a 41 (93rd percentile) on the actual GMAT. I’ve heard it helps to read a lot of newspapers, magazine, periodicals, etc., but I’ve never been much of a reader. So how did I perform so well? During reading comprehension questions I did my best to pretend like I actually cared about what I was reading. While I might not really care how or why a star’s light rays are bent by the gravitational pull of a nearby galaxy, I temporarily put on my “astrophysicist cap” and pretended to care. I tried my best to actually learn from the passages. I think this helped me retain the information better, or at the very least it helped me go back and locate information in the passage later. For sentence correction questions, rather than search for the best sentence, I searched for the worst sentences and ruled them out. Sometimes I’d read the original sentence and think, “this is obviously not right.” Yet when I read the other four options I’d determine that the original sentence was, in fact, the best choice. Another tip: take practice tests! It is vital to get your question pacing on track. I found it difficult to let go of a question (i.e. guess the answer), because I desperately wanted to determine the correct answer every single time. By taking practice tests I learned I could not linger for too long on multiple questions or else I would get off pace, which could cause me to panic. 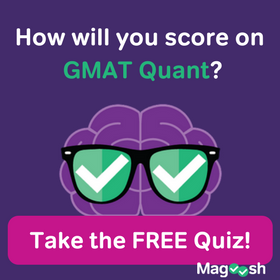 The better option is to use the Magoosh strategies to narrow your answer choices down to just two or three, then go with your gut and forget about it (at least until review time if it’s just practice). I often found myself with about a third of a section’s questions remaining and only a quarter of the time remaining. I had to pick up the pace on the last 10-12 questions of the quantitive and verbal sections… not a fun feeling. I actually ran out of time and failed to answer the last question in the Integrated Reasoning section of my second practice test and my actual GMAT test. If I could re-do my studies: I would have started sooner. 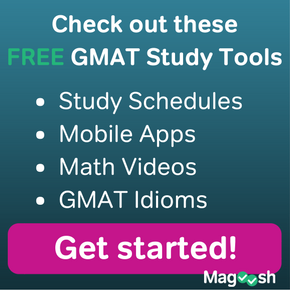 I didn’t mentioned it above, but I put off studying for the GMAT until just two weeks prior to the test. Because I waited so long, I forced myself to bear down, and I spent many stressed out hours in front of the computer cursing myself for not starting earlier. To make studying even more difficult, my wife and I had a baby about a month before my test date. Of course my newborn son required constant attention, which just elevated the stress factor. I am so thankful for my beautiful, caring wife, Leslie! She really stepped up and allowed me to focus when necessary. Don’t let incorrect answers (or forced guesses) throw you; just be happy you’re being asked such hard questions!